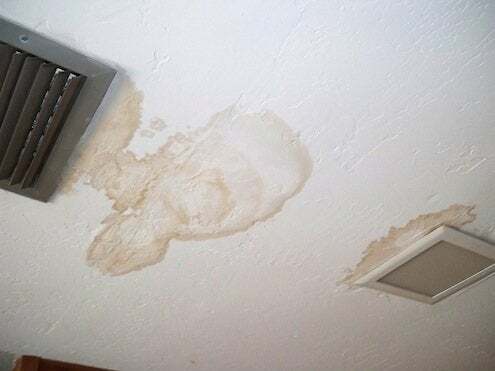 Water spots on ceilings and walls aren’t just unsightly–they can be a symptom of a much bigger problem that needs attention. Blistering or peeling paint, loose plaster, yellow or brown streaks, and spotting are all caused by chemicals in the wall material reacting to water that shouldn’t be there. Inspect your roof, attic, gutters, trim, windows and siding carefully to find the source of the leak. If you’re in doubt, an experienced builder will usually know right where to look. An interior leak from a toilet, pipe, or condensation from an attic duct could also be the culprit. If your kitchen or bath isn’t properly vented to the outside, humidity can build up in the attic or behind walls and start moisture problems. Once you’ve tracked down and fixed the source, you can work on the cosmetics. For painted wood or trim, remove the peeling paint, sand and apply two coats of enamel. For isolated spots on drywall, wash the area with detergent but don’t soak it. Apply a stain-blocker or sealer to keep the stain from bleeding through when you re-paint.